Everyone knows, a new San Diego Derby Dolls season starts at the beginning of each year for the Wildfires as they embark on their journey to Battle on the Bank in June. What about the rest of the league, though? It’s fun to cheer on our friends and leaguemates, root for the TURQ…but what about the rest of us? Last year a new team was formed for those who wanted to continue to play competitive roller derby, skaters willing to put their home team jerseys aside (like the Wildfires), new skaters wanting to play their first few games and grow as individual and team skaters. And so, the Sparks were born. BOOM! And coaching the team this season will be veteran skater Lemon Drop. As the captain, my goals for the Sparks are to learn to work as a cohesive unit, build up the team’s overall athleticism and create a positive environment where everyone feels they can compete to the best of their ability. After a few weeks of practice, it’s clear that these goals are coming to fruition. Come watch us play and bring the SPARK, SPARK SPARK, BOOM!!! Sparks first bout will be an away game against Beach Cities Roller Derby in Torrance, CA on Saturday, February 28th at 7:00 pm. 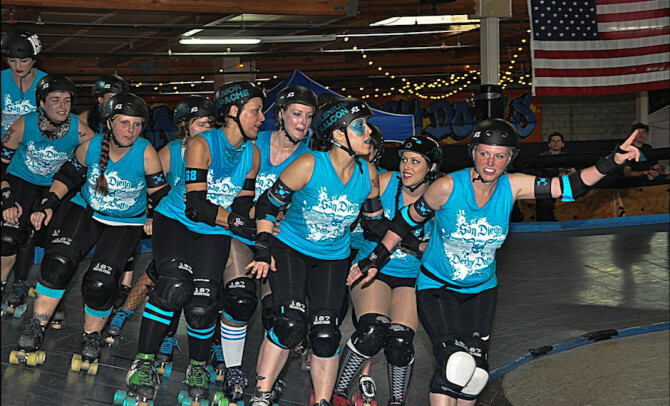 Our first home game will be against the Los Angeles Derby Dolls on Saturday, April 11th at 7:30 pm.